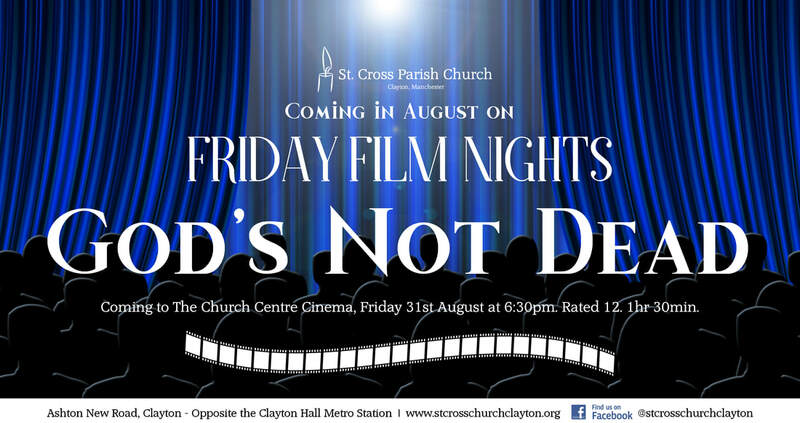 We are excited to announce that, starting on the 1st June 2018, St. Cross will be holding monthly Friday Film Nights!! They will (usually- please double-check the website to be sure!) be on the last Friday of each month from 6:30pm in the Church Centre. All the films are rated PG or 12 and will have a Christian theme so we can deepen our understanding of our faith together. Everyone is welcome including families but please check the listing to ensure suitability for your children. There will be a light meal/snacks available at 6:30pm before the film starts at 7pm. Please let Fr. Chris know in advance if you have any food allergies or special dietary requirements! Come and join us for an evening of film, fun, friends, family, faith and food!! When an atheist Philosophy professor plans to forego dusty arguments in his class, he insists the new students declare that God is dead. Unable to do this, Josh is challenged to defend his faith and prove to the class that God’s Not Dead. Against all odds, Josh stands up for his faith and takes on the challenge. Let the debate begin. With enthralling performances from the star-studded cast, God’s Not Dead, is an intensely thought-provoking, faith-inspiring and uplifting film. For complete listings, including Age Ratings, of the films we will be showing throughout 2018, please click here.